Judging by the titles of his records, it’s clear what Vienna-based dancehall artist, Rekall, believes his role is in the world of reggae music. His first solo full length was called Vienna To Di World, an exclamation that firmly deposited the singer as the conduit between his hometown and the global reggae scene. He doubled down on that notion with the title of his newly released EP, Vibes Ambassador - a short, but sweet showcase that plays to the singer’s strengths with innovative re-licks of familiar foundation riddims and appearances by some of Jamaica’s top talent. The throwback nature of several of the tunes on Vibes Ambassador gives the EP a pedagogic feel, establishing Rekall as a scholar of the genre and not just an opportunistic appropriator of the culture. 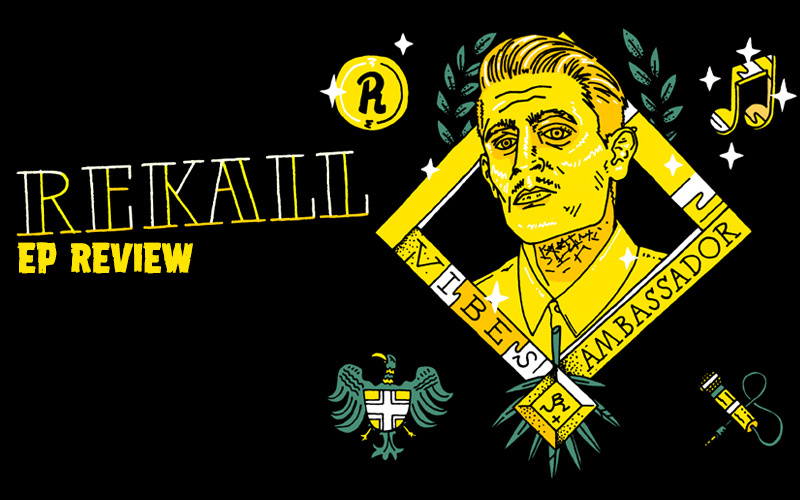 This nostalgia also plays to Rekall’s vocal strengths, as his soft, crooning vocals seem to be directly teleported from the singer-heavy dancehall riddims of the late 80’s and early 90’s. Listeners will see this come to life with tracks like One Drop, backed by an African Beat Riddim re-lick produced by Germaican Records founder, Pionear. African Beat, which was made famous by Barrington Levy’s Under Mi Sensi, is the perfect accompaniment for Rekall’s smooth vocals, and his old time reggae party lyrics inspire a sense of fun, timelessness, and oneness. One Drop turned out so well, it isn’t a surprise that another recycled Barrington Levy classic, Hot Milk Riddim from the Levy smash, Murderer, appears later in the EP. A Silly Walks production, Friendzone, which features Jamaican dancehall diva, Keida, brings Hot Milk into the 20-teens, with an upbeat dancehall arrangement and video game-inspired sound effects. The back-and-forth combination of Rekall and Keida is a natural winner, with a consistent energy that both artists are skilled at maintaining. Although Friendzone is essentially a love song, it takes a refreshing angle. This is also true of Confession, a House of Riddim produced tune that features dancehall veteran, Red Fox. A plea to a mother for the hand of her daughter, Confession is built on a relatively fast-paced one drop riddim, that occasionally breaks down into a mean dancehall-style mix. Red Fox is a nice addition to the tune, adding a rougher deejay style to counter Rekall’s buttery smoothness. The Austrian outfit, House of Riddim, also produced the titular tune, which establishes the tone for the project as the lead off track. More contemporary reggae than nostalgic dancehall, Vibes Ambassador is a strong effort with well-sculptured, whispery verses and an impressive adlib section toward the end, but the combination of horns, background vocals, and Rekall’s lead makes the hook sound too busy and overwhelming. Rekall also gets support from his own production team, Bassrunner Records, headed by veteran producer, Luke Rich. Prison, an update to Rich’s previously released Prison Break juggling, is the most socially conscious track on Vibes Ambassador, and also one of the best. Unlike the lead off track, the background vocalists blend nicely into the hook, with horns only used as punctuation. The first single from the album, Easy, is also a Bassrunner track, with more conscious themes and a chorus borrowed from Yami Bolo’s When a Man’s In Love. Contemporary reggae superstar, Agent Sasco, provides a phenomenal guest appearance on Easy, adding weight to the track, authenticity to the project, and credibility to the talented reggae singer from Vienna.